Although Alfred Parsons was born and bred in England, much of his work is so associated with America that in one authoritative treatise on art it is classified in the American section. He was born in 1847 at Beckington, in Somerset, and was educated privately. He began life on his own account as a clerk in the Savings Bank department of the Post Office, but after two years as a Civil Servant turned his attention seriously to painting. His work falls into two main divisions; the one his illustrations of literary masterpieces such as those which appeared in Harper's Magazine, the other his landscape pictures. He collaborated with the late E.A. Abbey, R.A., in illustrating Herrick's Poems, "She Stoops to Conquer," and old songs, and on his own account he illustrated Wordsworth sonnets. 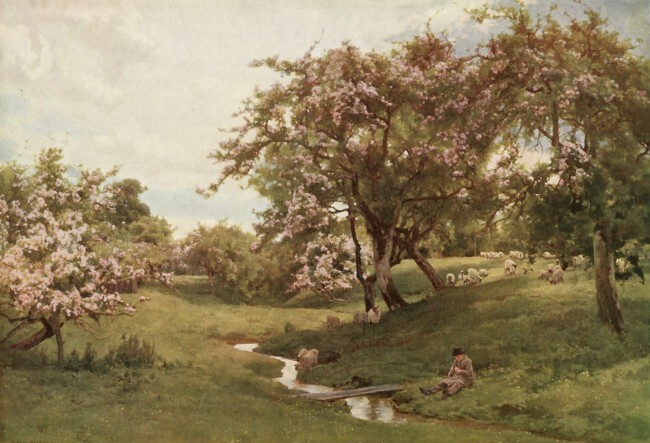 Special exhibitions have been held of his paintings of scenery on the Warwickshire Avon, gardens, and Japanese flowers. He also wrote and illustrated a work on Japan, and produced with the late F.D. Millet pictures of the Danube from the Black Forest to the Black Sea. His work was a feature of such exhibitions as those of the Grosvenor Gallery and the New Gallery, and also of the Royal Academy, of which he became an associate in 1897 and a full member in 1911. The present picture is the sole example of his work in the National Collection, and was acquired by the Trustees of the Chantrey Bequest in 1887, the year in which it was exhibited at the Royal Academy.